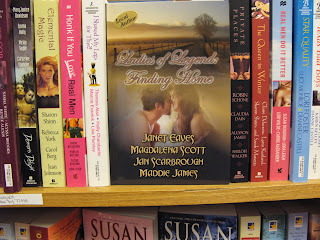 The Un-Official Blog of Romance Author Maddie James: On the Shelf! From conception to publication, there are several milestones I celebrate as an author. is another huge hurdle. Final edits are exciting as is reading the galley and at last, handing your baby over to the editor for publication. Since I work with a small press, there are a couple of other milestones for me--when the electronic version hits the publisher's website, then Fictionwise, followed by the print verion going up on Amazon. All reasons for celebration. Ah, but this morning, I celebrated once more, when I saw my books on the shelves in one of my favortie bookstores. And here is Ladies of Legend, too! Along with a host of other anthologies. Thanks, Gina, for taking care of our books! So, if you are in the Lexington, KY area, and in the state of mind for bookstore shopping, be sure and visit Joseph-Beth Booksellers there at Lexington Green and check out the romance section, okay? I'm sure you'll find lots there to choose from.